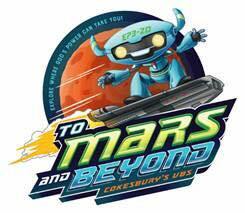 To Mars and Beyond VBS invites Voyagers ages 3yrs – 5th grade on a space travel adventure to explore where God’s power can take them! Along the journey, Voyagers discover a new realm of possibilities as they reach for the stars and encounter the limitless power and love of God! Dates are August 5 – 9. 11:00am – 1:00pm – Aftercare – $75.00. Click here to register.